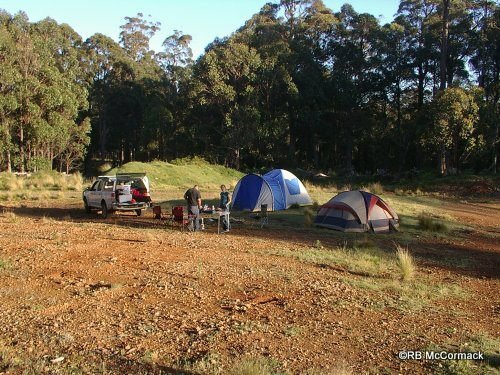 New Year’s eve 2010 was spent up the mountains in Nundle and Tuggolo State Forests about 250km north of Sydney. These are forests along the top of the Great Divide around the 1200 to 1300mtrs high which is pretty high for Australian Mountains. A few months ago in spring when we were last here it was snowing but now its summer and its cool but sunny and dry. The forests are a mixture of native eucalypts and plantation pines. The pine areas are easily accessible but much of the native forest in only accessed by long distance hikes. As part of the Australian Crayfish Project (ACP) we are researching a high altitude Euastacus crayfish species that is only found in the streams above 1000m in this section of the Great Divide. 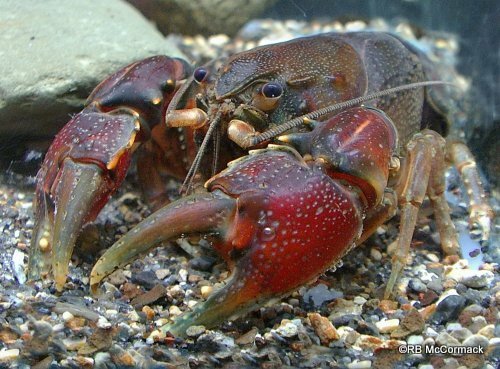 Euastacus gamilaroi is a small crayfish that is found on both sides of the Great Divide and that’s a bit unusual as most species are usually on one side or the other. Gravel forestry management trail through the forest provide access to large areas. We arrived late afternoon and started to set up camp in the forest near one of the streams we wanted to sample. It was a 2.75 hour drive to get there so the first thing we did when we arrived was set up the table and chairs, open the esky and pour a drink. This takes all of 2 minutes. By the time we have the esky out but before we could pour a drink we all noticed large numbers of leaches crawling up our legs out of the long grass. No problem, pulled out a tarp and threw that down with the plan of putting the table and chairs on that and then sprinkling some salt out to discourage the leaches. Now this is long thick tussock grass under large eucalyptus trees, it is cool and damp all the time. I moved one chair onto the tarp when Tegan noticed the spiders. Seems the grass was also full of spiders and when we put the tarp down they all decided to see what’s on top of the tarp. All around the edges of the tarp spiders were crawling over the edge. Don’t know what sort of spiders, don’t care, were outa there, I’m not happy with spiders. We threw everything onto the back of the truck and laid rubber. We checked out a few other camp sites but all the same, leaches and spiders so finally we settled on a quarry that’s was used to make the forest roads. Here open, no long grass, no leaches or spiders. I was there with Tegan and Josh and they are avid hunters. The forests we are in are large about 32,000 hectares and are full of wild non native animals like foxes, rabbits, pigs, deer and goats so are great hunting areas. Recreational hunting in Australia is strictly controlled and you need to be members of the Game Council and register to shoot in the forests, etc. and only limited numbers of shooters are allowed at any one time. We registered for shooting and had the whole forest to ourselves. 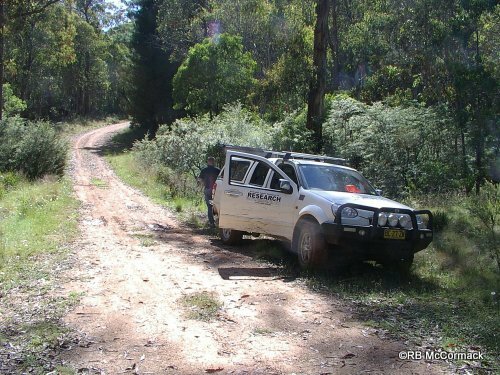 We had a simple plan, we would drive along the forest roads to a gully of creek crossing and I would get out and survey the creek and Tegan and Josh would move forward hunting and after Id finished my survey, say 30 minutes later Id drive down the track and pick them up and do it all again at the next creek crossing. We were also in contact by 2 way radio so it was easy and efficient. Josh cleaning a rabbit for lunch. We all saw foxes, pigs and deer but they didn’t shoot any, they did shoot lots of rabbits that we cleaned and fried up rabbit for lunch. There were also lots of fruit tree around and most had loads of fruit so we picked buckets of green apples and shiro plums. It was a good trip, eating fresh rabbit for lunch and fresh fruit for dessert. All the blackberries were flowering now so in a few months when we are up there next well have a feed of blackberries and get enough for some jam. 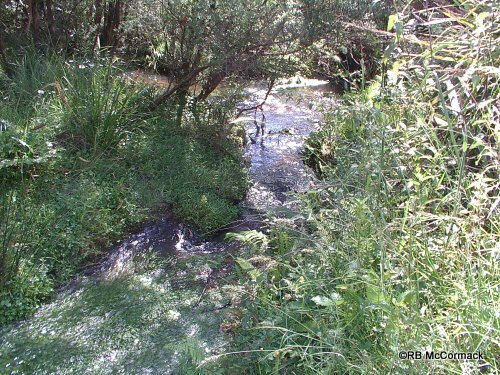 The streams in the area are small, fast flowing, slightly turbid and very cool. 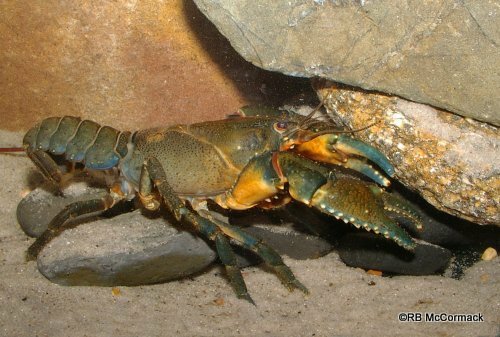 Euastacus maccai tend to be away from the streams and in the wet, swampy, seepage areas. 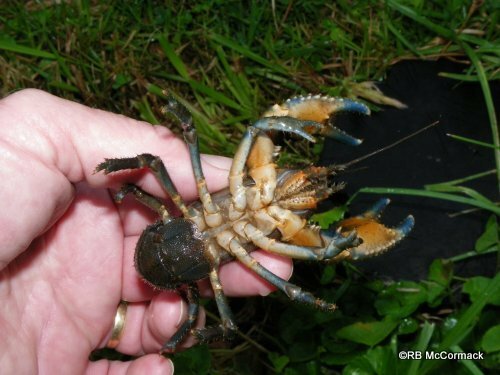 They are a more terrestrial crayfish and we are developing a bunch of different snares to catch them. Made from mist net, wire and rubber bands they are proving very effective – the paper on this trapping method should be out this new year. The main species in the area are Euastacus gamilaroi and Euastacus maccai, both are found on both sides of the Great Divide and currently I am working with Shane from the Australian Museum on these and other species along the Great Divide and we are just getting ready to run a set of DNA analyses of the species in the area so we are attempting to collect specimens from across the species distribution and map that distribution. This project has been going for many years now but hopefully this new year will see the papers completed on a bunch of species for this unique section of the Great Divide.